Before you set any designer plans for your kitchen, it is imperative to design the basic layout. The layout will not only decide the flow of work from one section to another, it is also important for the arrangement of cabinets. Hence kitchen cabinet layouts should be planned prior to choosing your cabinets. Just as with the kitchen layouts, cabinets are arranged in the same order, i.e., Single Line, U-shaped and L-shaped. The basic kitchen cabinet layout would be a single line arrangement wherein the cabinets are arranged in a single straight order. This arrangement is ideal for small kitchens wherein space is a constraint and this arrangement provides ease of access and work in the kitchen. However, with this arrangement, the storage may be constrained in a small kitchen. For a large kitchen however, this arrangement is good enough as storage and ease of work both are possible. The wall cabinets too are in a single line up to the sink area. This layout works well with open kitchens, ones that extend into the living room. 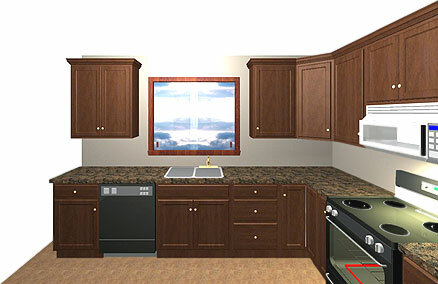 U-shaped kitchen cabinet layout has cabinets arranged in U shape along the kitchen area. This arrangement works well for medium and large sized kitchens. The base and wall cabinets are placed in the same way. Larger storage and a triangular work area are the key advantages of this layout. The corner cabinet is a little difficult to arrange, access and maintain, but can be used for sparingly used items. An island top in the midst of the U-shape can also be designed to have two or three cabinets. This layout provides largest storage amongst all the layouts. L-shaped kitchen cabinet layout is good for medium and large kitchens. The wall and base cabinets are arranged along the two legs of the L shape. This layout too provides good amount of storage and ease of work. The section parallel to the longer leg of L shape can be utilized by keeping a tall cabinet. This way you can maximize your storage. If you plan to introduce an island in between, you can install one or two cabinets to get that extra storage space. Interestingly, in L-shaped layout, you would have only one corner cabinet to deal with. The other corner cabinet is relatively free to access. 1. With a U-shaped kitchen cabinet layout, you will get two to three base cabinets apart from those in a single line arrangement. Apart from that you can arrange wall cabinets too in the same layout if that does not totally make your kitchen congested and uncomfortable. 2. Do not try to introduce more than one or two cabinets on the parallel sides of U shape, as in a small kitchen your movement may get restricted. 3. Since one of the parallel legs of the U-shape will be the sink area, you can keep a single cabinet that will be used sparingly as compared to other cabinets because such cabinets are generally used for stocking kitchen cleaning liquids, scrubs and detergents. 4. In case of L-shaped kitchen cabinet layout, although one side of your kitchen will be free of cabinets, but that can be utilized for keeping fridge or other miscellaneous items like a vegetable organizer etc. 5. Keep the short leg of L-shape small to accommodate only one or two cabinets. This leg can be comfortably made as the sink area cabinet so that it will be sparingly opened through the day and more so it will not have any wall cabinet. Thus you can have a linear wall cabinet arrangement and avoid your kitchen from looking congested. It is important that you have a comfortable space for movement and work in your kitchen. Storage can always be extended in form of a tall cupboard, wall mounted shelf or an organizer. However, once you decide on the layout of your kitchen, your cabinets will follow the same and cannot be replaced or re-arranged so easily. Hence plan out your kitchen cabinet layout well considering your space constraint and your comfort. Also, be sure to check out this kitchen design software. It is a new generation of 3D software that gives you a real-time cinematic kitchen design. Interesting points. Getting the right kitchen cabinets is important for your kitchen as it will help it look better as well as provide the right amount of storage space.